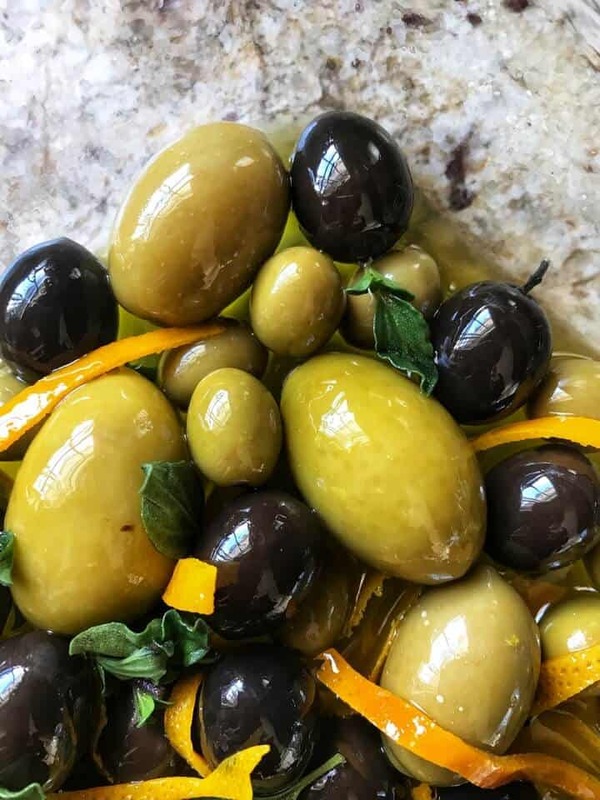 This recipe for these Easy Oregano Orange Marinated Olives is sure to be a hit at your next cocktail party. Olive oil is gently heated and lightly scented with oregano and orange zest before being added to the olives. You will create an easy to make party finger food to serve your guests. These marinated olives also make the perfect addition to any cheese platter. I love it, especially outdoor entertaining in the summer, and in particular, on long week-ends. If you are like me, you love recipes that can be made ahead of time because entertaining friends and family should be fun -both for the guests and the hosts. 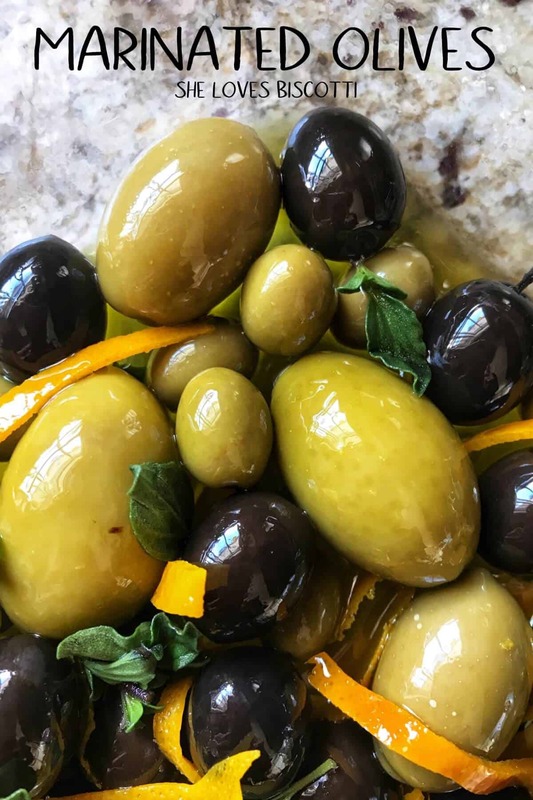 Whether planning for a cocktail party or hosting a wine and cheese get together, these Marinated Olives are a must. The best part of this recipe is that it doesn’t involve hours of preparation. 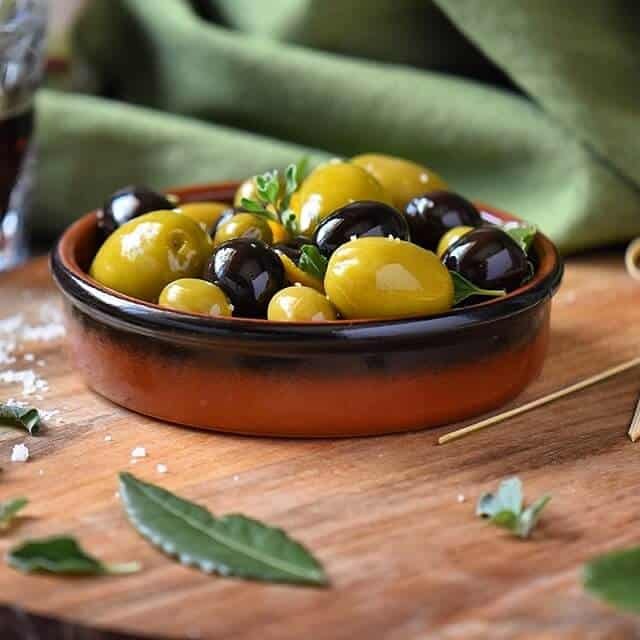 With an investment of only fifteen minutes and just a few key ingredients, these marinated olives come together in no time all. I can’t wait to share this cold finger food recipe with all of you… come and take a look! The first thing we are going to do is remove the zest from the orange. If possible, try to get long strips without the pith. What exactly is the pith? As you probably know, the pith is the white part situated just beneath the outer peel of any citrus fruit. Oranges, grapefruits, lemons, mandarins and limes all have this spongy white pith. Although slightly bitter tasting (especially the grapefruit), the pith is actually very healthy. In fact, it is a source of fiber, Vitamin C and flavonoids. A potato peeler or a sharp paring knife both work really well in removing the orange zest. If using a potato peeler, simply hold the orange in one hand, the potato peeler in the other. Then, simply start peeling your orange. If using a paring knife, cut off both ends of the orange. Then, stand the orange upright on your cutting board. With a very sharp knife, start cutting away the peel from the pith. As you work your way around the orange, you will get strips of orange peels. 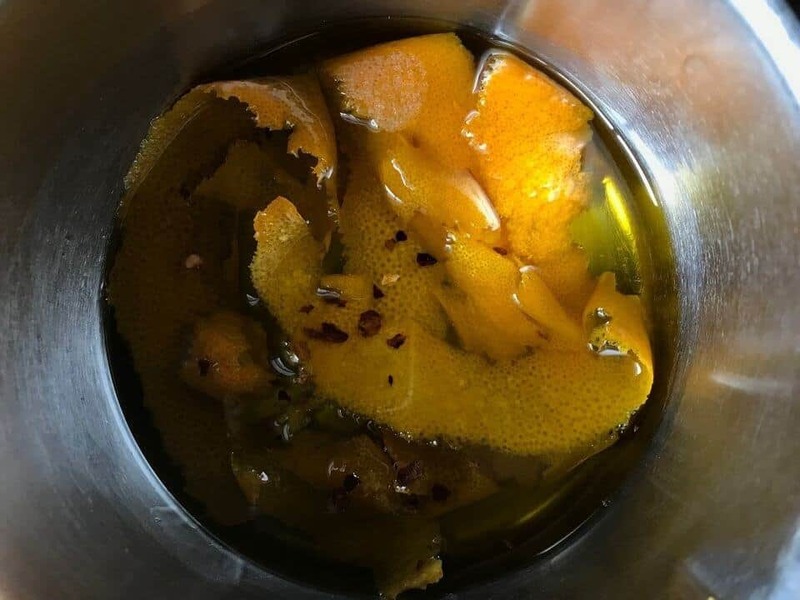 Once you have peeled the orange, add them, along with a few pinches of red pepper flakes, to about half a cup of extra virgin olive oil and heat together in a small saucepan, on low heat for about three minutes. Then, simply remove the pot from the heat, cover and allow about ten minutes or so for the infusion to take place. We are now ready to add a variety of olives (black or green) and minced fresh oregano to our orange scented oil. You have just transformed some briny olives into a citrus sensation! These marinated olives can be used immediately, or they can be refrigerated for up to five days. If you do refrigerate them, you can heat them up gently for a minute or so or leave at room temperature for about an hour before serving. I love bookstores. And as you can probably imagine, I especially love cookbooks. Call me old fashioned but there is something special about flipping the pages of a cookbook and getting a feel for the recipes, especially when there is beautiful food photography. Don’t get me wrong, I love the convenience of all the technology that surrounds us today. Think of a recipe, any recipe, and can you have access to it in just a few milliseconds. Still… I love my cookbooks. 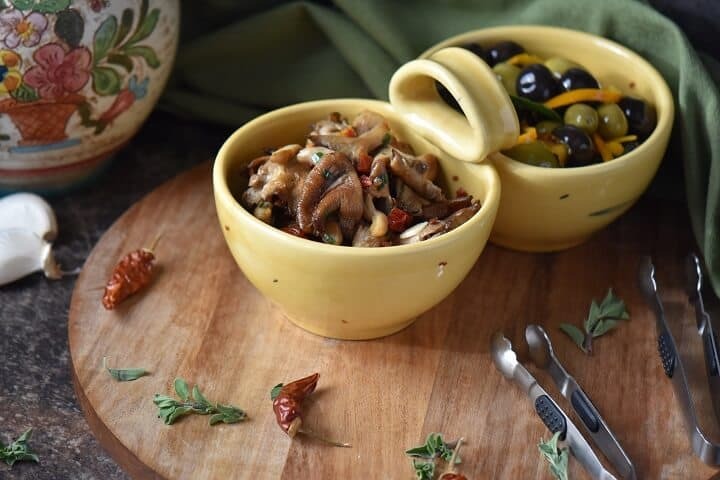 This Marinated Olives recipe is from a cookbook entitled “Simple Italian Snacks”. It is one of my go to cookbooks when I am looking for original bite-sized, tapas-style outdoor entertaining ideas. The only minor change I made to this perfect recipe was to add a sprinkle of fleur de sel. If you are looking for some other cold party appetizers, take a look at this recipe for these Goat Cheese Bites. It is a little more time consuming, but oh so very tasty. Another staple for my summer parties is this classic Tomato Bruschetta. In this post, I have included a few tips in order for you to transform a good tasting bruschetta into a taste sensation! Don’t miss it! 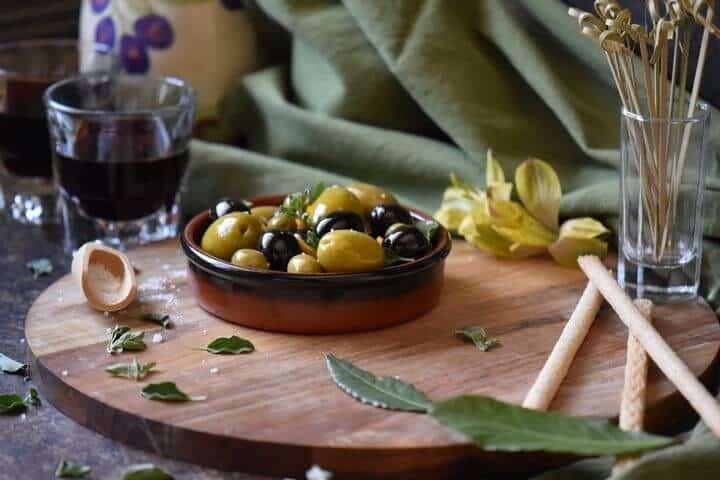 ★★★★★ If you have made this Marinated Olives recipe, I would love to hear about it in the comments below and be sure to rate the recipe! This recipe for these Easy Oregano Orange Marinated Olives is sure to be a hit at your next cocktail party. Olive oil is gently heated & lightly scented with oregano & orange zest before being added to the olives. These marinated olives also make the perfect addition to any cheese platter. The perfect party food! With a sharp knife or vegetable peeler, remove peel from orange. Over low heat, combine the orange peel, olive oil and red pepper flakes in a small saucepan. Heat for about 3 minutes. The oil should be warm to the touch. DO NOT OVERHEAT. Remove the saucepan from the heat, cover and allow the orange peels to marinate for about 10 minutes. Add the assorted olives and the oregano and combine gently with the infused olive oil. Garnish with oregano leaves (if using) and a pinch of fleur de sel (if using) and serve. Any brine-cured, canned or jarred olives can be used for this recipe. 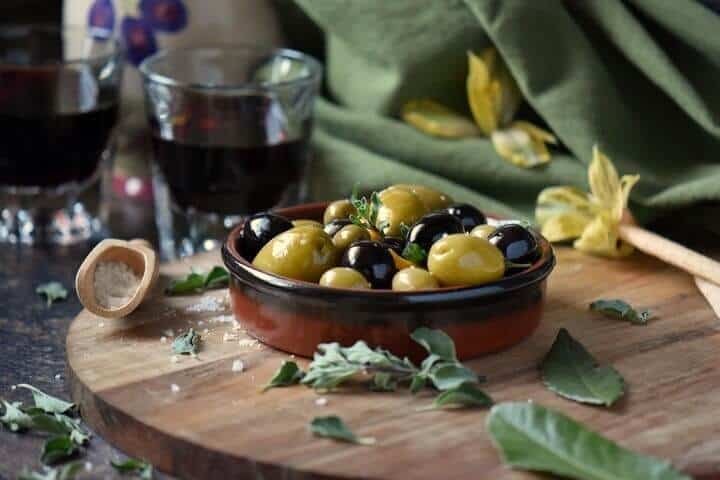 DO YOU LOVE THIS MARINATED OLIVES RECIPE? Are the olives used jared? Absolutely perfect at sunset with a nice glass of wine. I have never marinated my own olives. Very interesting and they look delicious. I love your photos Maria! Very nice pictures. And as I love olives I ‘ll certainly try your recipe. Thank you! 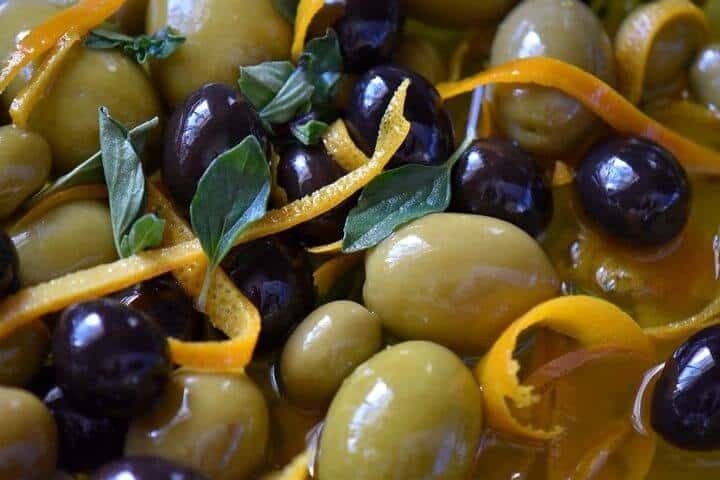 Having just returned from Spain, I am intrigued with your Easy Oregano Orange Marinated Olives, Maria! We enjoyed so many lovely olives wherever we travelled throughout our journey. I am excited to try your recipe – thanks so much for sharing! Oooh, I love marinated olives! Just don’t make them often enough…then again, I’d just sit down and eat them all. BTW Your photos are beautiful! I have used rosemary with olives, but never thought to add orange. What a bright idea. Nice photos! Marinated olives are such an easy little appetizer to put out when serving cocktails.